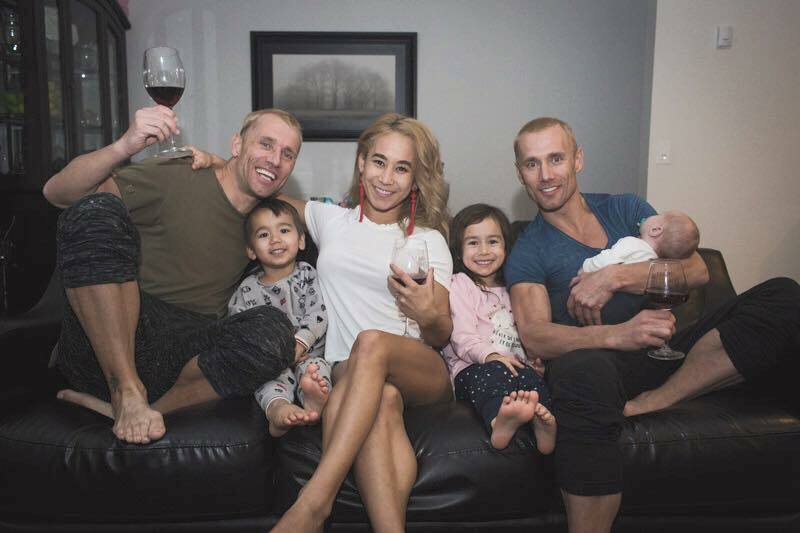 Andrew, Kevin and Gasya Atherton are a family of circus artists working at Cirque du Soleil. After witnessing Varekai in the summer of 2015, I immediately reached out to identical twin brothers, Andrew and Kevin to join me on Feisworld. Since then, we’ve completed two projects together including the buildout of their website AthertonTwins.com (launched in 2015), and their brand new workout series called 10 for 10 (launched in 2018), the first gymnastics and circus-inspired workout series for busy professionals on the go. All you need is your own body weight, no partner, no equipment. Andrew and Kevin Atherton were professional gymnasts in Britain before joining Cirque du Soleil at the age of 24. 18 years later, they have performed in major Cirque shows (Varekai, Zarkana, IRIS, Paramour) around the world, often as headliners with their one of a kind aerial strap performance. Gasya Atherton is a Cirque hand-balancer, who has become an overnight internet sensation when she shared her workout videos with her children, Kamali and Kaysen, in early 2017. Since then Gasya has built a tribe of 200,000+ engaging fans, including many inspired parents, on her Instagram page. My relationship with the Atherton family has transformed over the past 2.5 years ago. I was first a fan, then a consultant, an advocate, and today a family friend. I've travels thousands of miles to watch them perform in different cities, bringing my own family and friends too. Also joining me on the show today is my Associate Producer, Adam Leffert, who asked the Atherton family "How do you create art?" Our conversation was also videotaped - German Ceballos and I are working on a sizzle to share with you soon. Sign up for our newsletter to be the first one to know! Learn more about Atherton Family by visiting their website, follow Andrew Atherton, Kevin Atherton, Gasya Atherton (on Instagram). Learn more about my co-host, Adam Leffert, on his website. If you enjoy this episode, make sure to check out the previous episodes with Andrew and Kevin Atherton, and this one with Gasya Atherton. Leave us a comment below, we want to hear from you! [07:00] How do you manage to celebrate your life with family and work at the same time? [08:00] Do you think your kids are going to be circus artists? [09:00] Kevin, tell us about the new addition to the Atherton Family! [11:30] What are some of your thoughts and recommendations for people struggling with wanting to be parents but not sacrificing/impacting their career? [14:00] Does being an uncle prepared you in any way to be a parent? Did you have any change in perspective towards kids and your career now that you know you are going to be a father? [18:00] What is it like for the three of you to work together? How is your working dynamic? [20:00] You’ve managed to achieve a great work-life balance, not worrying about the non-important things and focusing on the essentials. What’s your secret formula? [24:00] How do you feel about your support network, including family and friends? [26:00] You are also responsible for your fans, in some way. What are some of your thoughts and things you’d like to say to your fans? [28:00] How do you keep extraordinary flexibility while developing strength? [29:00] What are some of the basics things you train for you? [31:00] What’s your workout routine? How hard and how often do you train? [36:00] What did you have to adapt or change after becoming public figures? [38:00] You mentioned being inspired by other art. How do you translate what inspires you to the stage? What is the creative process like? [41:00] When you try or see new moves from performing artists, what do you feel? Does it move you as an artist? [46:00] What are your recommendations for performing artists? [48:00] What would you say to young people that would like to be circus artists? [10:00] We’ve all had such joys in our lives. To be on stage and to perform gives us such rich feelings. But where we’ve found most of the joy it has been through the eyes of the children. You see the little things that those precious people do and it gives you so much joy and so much love. [13:00] Most people think it’s never the right time. I would always say, it’s always the perfect time. Because having a kid is such a magical thing in your life. [18:00] For us it’s about family. And every choice we do now, as far as performing goes, where are we going to go, which show are we going to be in, it’s all about family. Is it the best thing for our family? Is it good for our children? Is it an adventure? [20:00] I think as we’ve got older we just appreciate life. We appreciate everything we have. It’s not about money, for us it’s more about the freedom. We enjoy our job, we’ve never been to work not wanting to go to work. For us is almost not a job, because it’s a passion. It’s the same with having children. [36:00] As long as we continue to work in our art and to touch them in certain ways, and hopefully to help people’s lives in a positive way, we are going to continue doing that.